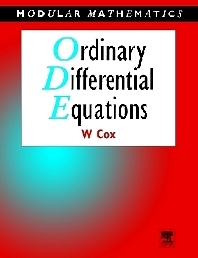 Building on introductory calculus courses, this text provides a sound foundation in the underlying principles of ordinary differential equations. Important concepts, including uniqueness and existence theorems, are worked through in detail and the student is encouraged to develop much of the routine material themselves, thus helping to ensure a solid understanding of the fundamentals required. The wide use of exercises, problems and self-assessment questions helps to promote a deeper understanding of the material and it is developed in such a way that it lays the groundwork for further study of partial differential equations. First and second year undergraduates in mathematics. Also useful for undergraduate physics and engineering students. Introduction and a look ahead First order differential equations - Methods and models First order differential equations - Analysis and approximation Second and higher order homogenous equations Inhomogenous linear differential equations Laplace transform methods for solving initial value problems Systems of linear differential equations Series solution of linear differential equations Special functions and orthogonal expansions An introduction to nonlinear systems Appendix - Chapter summaries Answers to exercises Bibliography * Index.